Back in the early sixties when my brother started school there was not a school for the deaf in our area. What happened was that he was placed in a speech program in a hearing school. We did not teach him sign language, mom and dad wanted him to be able to talk to hearing people and read lips. But as you can imagine it was very frustrating for him because he was missing so much. His education was severely lacking. My brother and I had homemade signs we used with our brother who is deaf. We did our best to communicate with him and never left him out of anything. My two brothers wrestled and played a lot together, and the oldest was much bigger. For the longest time my brother who is deaf was very small and it was easy for the oldest to get the upper hand. They were brothers through and through, there was no special treatment given to the younger brother because he was deaf. He kept telling me that when he got bigger he was going to be able to best our older brother and I so hoped that he would be able to some day! I realized early on however that others did not treat him the same. Somehow I made it my goal to protect him, not because mom or dad told me to, I just felt it was my duty. I became his constant savior whenever mom was not around. We would walk to school and back and even came home for lunch. I made sure that he was safe and I was only seven or eight when he began school. My parents realized finally that the education or the lack of education my brother who is deaf was getting was not enough. Dad worked in management for a large automobile company and was able to put in for transfers so he did some research and found a school in another state. This school too was an oral school but much more specific for students who are deaf and not just the speech impaired. This school was much better and my brother was able to have many friends but his education was still lacking. He could not communicate well enough to get the understanding he needed to learn and get a basic education. His reading and writing suffered, his math skills, science, and pretty much all areas of study were lacking. He did well in art because it was something he did not need hearing to understand. A few years went by and my folks realized his education was really suffering and finally were convinced that he should go to a school that taught sign language. They found a school in another state that had wonderful ratings and we moved again. This was a very difficult move because by this time my oldest brother was in the middle of his senior year, I was in the middle of my sophomore year, and my brother who is deaf was almost fourteen. We had friendships and were deeply involved with our school functions and it was so very difficult. I was having a hard time adapting and fitting in as well because the local way of life was so different from where we had come from. But as for our brother who is deaf things seemed to be looking up. He did not know a word of sign language when he came to the new school and it was an adjustment period for him but he picked it up right away. His education really just began at this point in his life as he was finally able to understand what they were telling him. 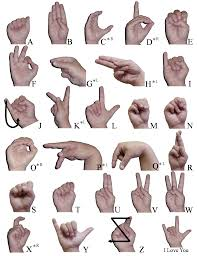 Back in the sixties and even seventies society and the powers that be wanted to stay away from sign language because they felt that people who are deaf needed to fit in and be able to communicate with the hearing world. My mom and dad felt the same way but it seems it was at the expense of most individuals who are deaf. Very few were able to succeed in their educations without the help of sign language. My brother harbored resentment for some time about not getting the proper education because of his inability to communicate. He still feels he got left behind in many ways. We eventually got acclimated to our new life. The school for the deaf and blind was a state school and had a large populous of students from all over the state. The school had a football team which my brother was a big part of. Just a few months after we moved there he actually had a huge growth spurt and was filling out nicely. It took us all by surprise! He joined the team and was really good at it, probably all that fighting and wrestling with my older brother came in handy. But I found myself protecting him more than ever. The local high school I was in actually played against the school with deaf athletes. The school for the deaf had cheerleaders as well which kept to the beat of their cheers by the use of a large bass drum. They still sounded deaf however and were the brunt of many jokes. I did not get angry with these people because I knew they were either cruel or ignorant. I would however step in if someone was getting upset with my brother for not answering when they were speaking to him. As I said before, because he was raised around hearing people he did not appear deaf, so many times someone would start talking to him when he was not looking and get angry if he did not answer. I would step in and tell them that he was deaf. Many times people would react as if he had a disease or was mentally impaired somehow. It was so weird to watch people’s reactions but I also realized that if they had not grown up around people who are deaf they would not know. Ignorance can sometimes hurt. I was eager to learn sign language myself so that I could better communicate with my brother. He was not patient in teaching me because as I said we had our own homemade signs and he was so very good at speaking and reading lips. But he taught me some and I had help in town from another friend who is deaf. After high school I took the test to work for the state and when I passed I applied for a job at the school for the deaf and blind. I began working as a teacher’s aide and learned so much about the deaf community that I did not know. My brother had always been at home with us but so many of those children are sent off to the state school because their parents do not want them. I found out that sometimes they even moved and did not let the school know where they were. They were of course hunted down but oh what a terrible thing for a child. The children went home on holidays and during the summers. Some would rather not. I started out working with the very young children from the ages of four up to ten or eleven. Many of them had severe emotional trauma as you can well imagine. My brother was blessed that he lived in a family that cared and that could afford to help him. Some parents cared but did not have the ability to give their child the proper care and there was no communication whatsoever in some of these families. Some of these children were abused as well. I learned so much that year and it broke my heart. The next year I worked with the high school kids and my brother was still there, it was his final year. He was so proud of me and told everyone I was his sibling! All of the kids would come by and talk to me because I knew sign language and I had a brother who is deaf. They felt at ease with me and me with them. They would discuss their problems with me and I would do my best to help them but they needed so much more. They needed love and acceptance and at that point in time in our country they were not accepted as normal people. I am so thankful that now, over thirty something years later people who are deaf are finally finding their place in society and the majority of the people do not look at them as if they have a catching disease. Ignorance is to blame for many people’s reactions. Anyone who knows my brother for more than five minutes would find that he is a very interesting, humorous, friendly, kind man well worth having as a friend. He would bend over backwards to help anyone and is multi-talented. He is employed as a glass-blower for electronic components, he is a good mechanic, he is skilled at carpentry, and he is a warm and outgoing person who easily makes friends, deaf and hearing alike. He has a second job at a grocery store bagging groceries and many of the people come up to him thinking he is the manager. He has a great smile and a big following at the store he works in. I have followed the community of deaf people over the years and seen what prejudices they have endured. I have watched the hearing community and how things have changed. I am so very thankful that more and more of the hearing community have an understanding and acceptance toward the deaf community but there is still a lot of ignorance to overcome. Always curious, Ashley Hardway is constantly learning and passionate about sharing what she learns with others. Based in the Houston, Texas office of Morningside Nannies, she loves to help families grow stronger, help their environments and communities, and keep moving forward! Check out @NannyLady on Twitter to connect and find out more.